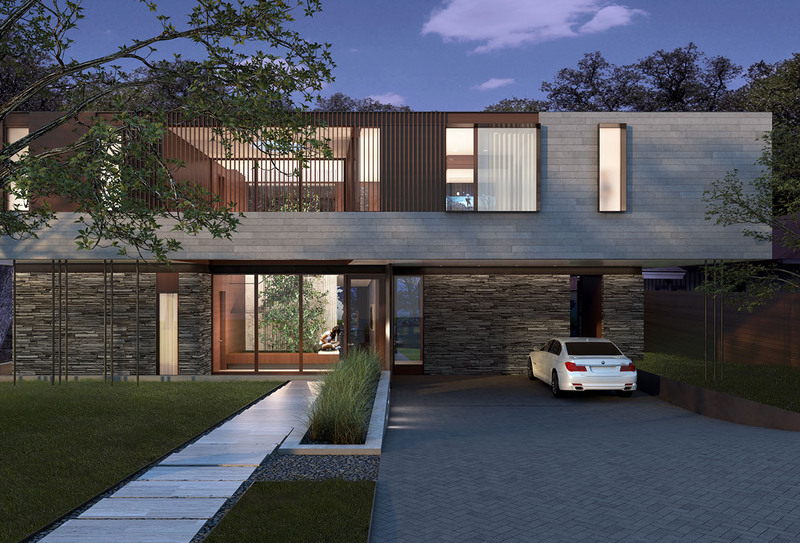 Baldridge Architects is a local, state and national award-winning firm with a practice known for its rigorous and restrained design philosophy resulting in a body of work that is known its unfussy clarity and contextual sensitivity. 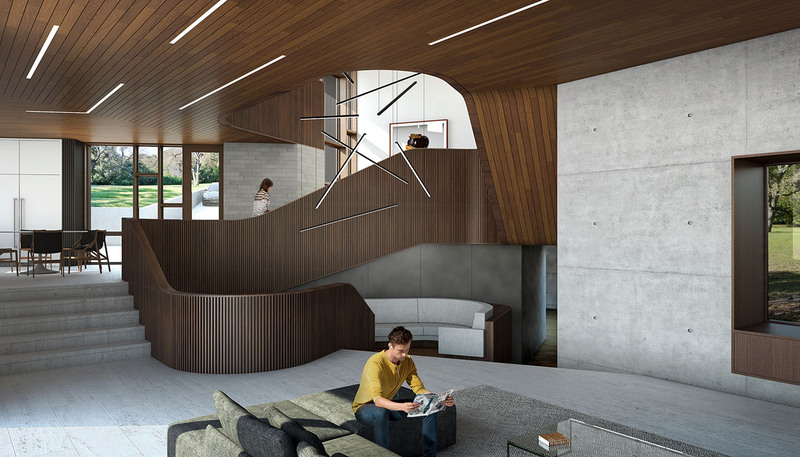 Our projects currently include high-end residential, restaurant, hotel, office, retail, historic renovation, elementary and higher-education design, as well as smaller follies. But at all scales, we are a firm that gears its focus toward projects seeking a full design process accentuating experience over surface. Proficiency in Revit, AutoCAD, Rhino, and Adobe Creative Suite, V-Ray preferred. 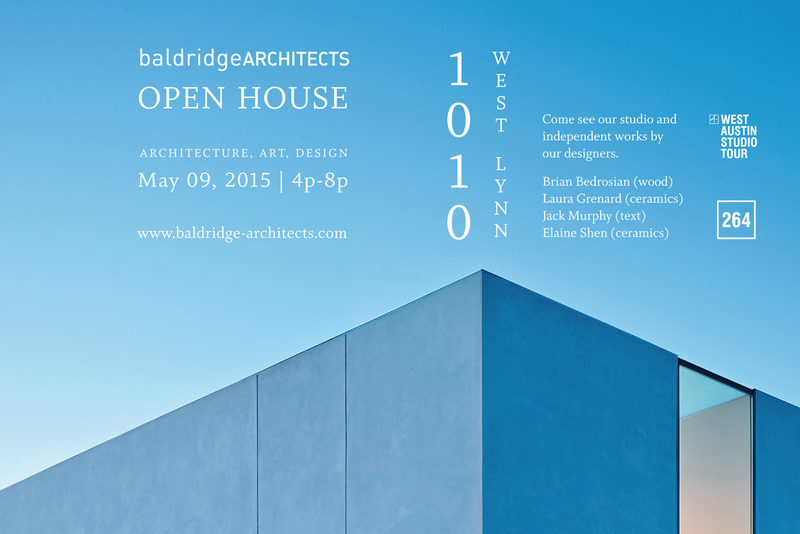 Please send your resume and portfolio to info@baldridge-architects.com. Please no calls or drop-ins. 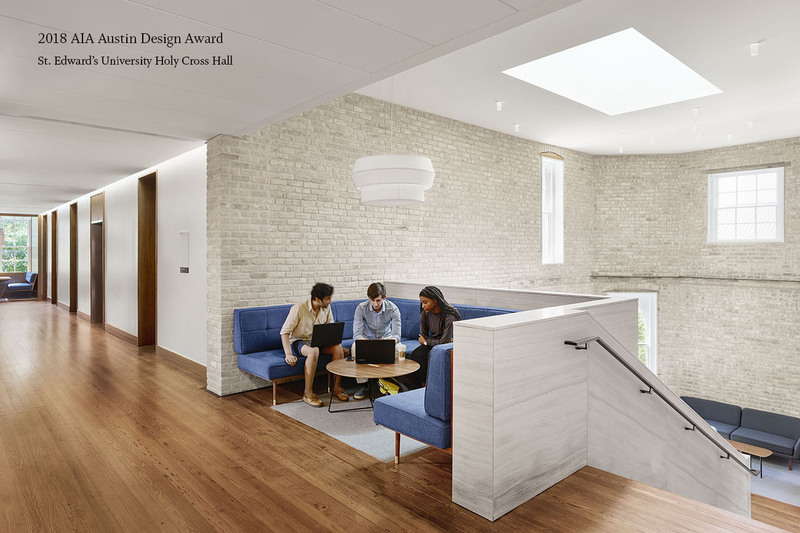 We are so proud that St. Edward’s University Holy Cross Hall was awarded a 2018 AIA Austin Design Award. We simply loved working on this project and with these people. It was a leap of faith to hire Baldridge Architects to work with a stately 1903 building in the first place. We firmly believe the results speak for themselves. To hear the jurors validate that is truly gratifying. A special thank you to the Benz Resource Group and to St. Edward’s University. The entire experience was awesome! 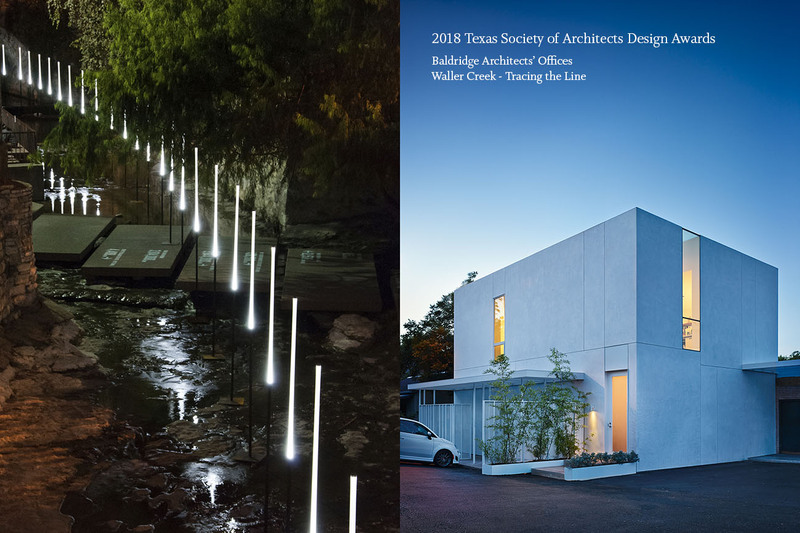 We are so excited that two of our projects were awarded two 2018 Design Awards by the Texas Society of Architects. 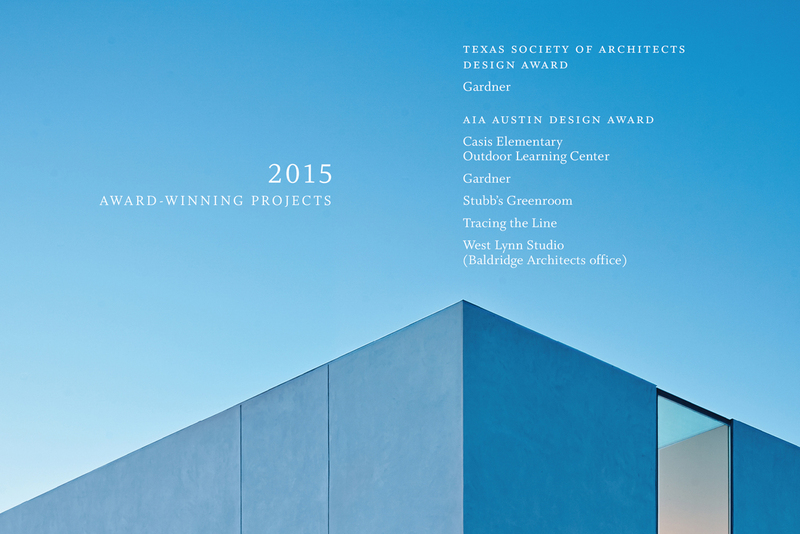 Baldridge Architects Offices and the Waller Creek Tracing the Line projects each received a nod from the jurors. These are both older projects and we are enjoying working on the larger institutional, residential and commercial projects, but we truly love these two. A big thank you to the TXA and to the jurors! We have not posted since October. It was a busy 2016. We are very excited about where we are headed in 2017. Our “Zilker 3” house finished in January and it is one of our favorite spaces yet. The “Ledgecroft Residence” finishes construction in August and Dalgleish Construction is simply killing it. We would share photos, but the gents at Dalgleish are so careful about protection that all we can show are pictures of blue foam! The High Road will finish in Summer 2017 as well. 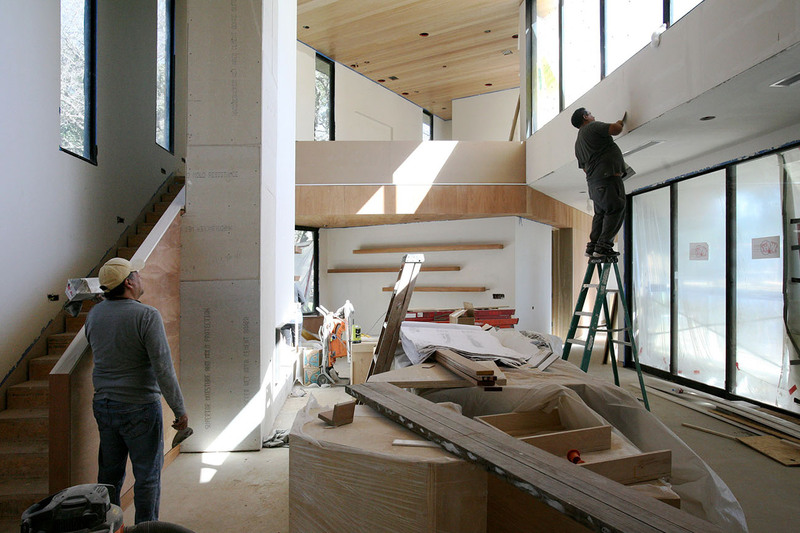 Risinger & Co. have just completed the most … um … sick cantilevered stair we’ve ever designed. Likewise, the “Untitled Hotel” begins construction this Spring. Eventually we’ll tell you about it. While the cat is out of the bag in certain circles, we’re not talking. We are really excited about the working with the builder on board. St. Edward’s Holy Cross Hall and Main Building are both in full construction mode. I have never seen a more beautiful partially demolished building in my life. You should check the newly posted photos at the project link. 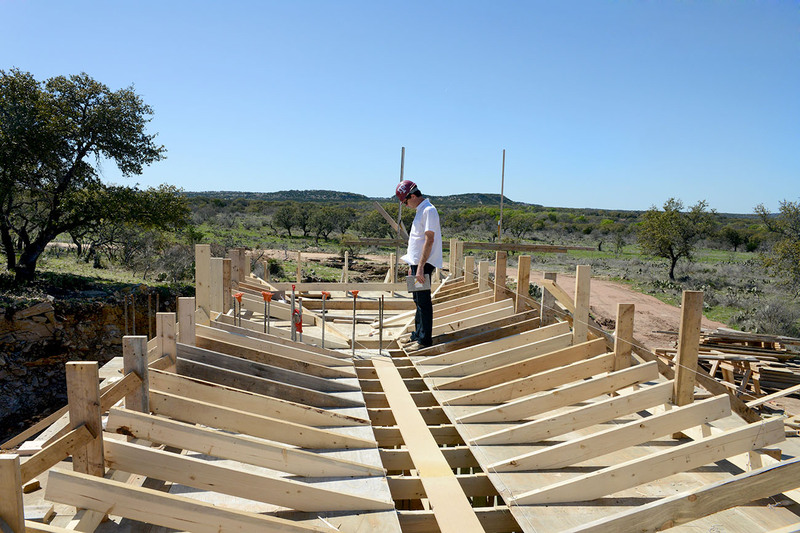 Also, new project in Barton Hills (with Pilgrim Building Company on board) and another home in Possum Kingdom, Texas. We’ll post more soon. This time we promise. The Homes Tour is upon us! We are honored to be included in this year’s impressive lineup and are very grateful to our clients for allowing us the opportunity to show off their house. Baldridge Architects is not Burton Baldridge; it is the collaboration of 9 gifted designers: Burton, Brian Bedrosian, Michael Hargens, Laura Grenard, Elaine Shen, Jack Murphy, Aaron Sleator, Stefan van Biljon and Ryan Flener. One of us will be in the house at all points during the tour. If you have questions as to the “why” of this house, we would love to talk to you. Members of Baldridge and Acero Construction are working presently to polish the place to a high shine. We look forward to seeing you. Ambitious clients, a daring structure and a cool program. What more could you ask for? We can’t say much about this except that it is real and it is targeted for construction in early 2017. 2016 has been a weird year for us. But for the routine hiring posts, a look at the web would suggest that work at Baldridge Architects simply stopped at the end of last year. That’s not the case (wow, is that not the case). We are so proud of the new projects and cannot wait to show them to you. For those who follow us, we’ll be less elliptical about our work in the coming months. A new house, great site, incredible clients… what more could one ask for? This is the first rendering of our approved schematic design for the next Baldridge Architects house. We have a name for this one (internally) but it gives our clients’ identity away so we’re staying mum for the time being. It has been a frightfully busy year, but we are united in our resolve that a “nice” end result is no longer good enough. We’re swinging for the fences. We can’t wait to see this one through! Brian and Burton had a great day today out at the Ledgecroft residence today. It was a beautiful spring day and we got to spend some time with our friends/clients and with our friends/builders, Ryan and Ed from Dalgleish Construction Company. The work these guys are doing is simply exquisite. We have moved out of the architectural concrete phase and are essentially complete on the structural steel scope, courtesy of Dennis Steel. Those guys hit the job like an army and completed their complicated scope in an almost incomprehensibly short period of time. Presently there are three groups of framers working on the light gauge metal framing and the wood infill framing. Our windows come in a month, but watching this jobsite in action was inspiring. (There is a very good reason we are no longer design-build). Looking at the long elegant lines of the project in its expansive Hill Country setting was something Burton was not prepared for. This one is going to have some magic. That d-crain have hit the jobsite in full force and have already done some truly inspiring work was frosting on the cake. We’ll post more soon! Exciting times to be sure. Acero Construction is killing it at Branch House. We are really proud of this one and it is a joy to see it coming together. We will definitely be posting more soon. Cool plan. Cool section. Cool mass. Cool clients. Really a special place. It’s been a weird year for Baldridge Architects. We have put together some of the best work we have ever done over the last months. But the projects are big and to some extent they are still under wraps. When we can, will post some images of them. We are honored and ecstatic to have been selected by Architectural Record for inclusion in its Design Vanguard 2015 feature. This year has been a truly gratifying experience and we are very happy that our work is suddenly reaching a wider audience. Baldridge Architects could not be more grateful to our clients for their belief in us over the last ten years. We cannot wait to see what the next decade will bring. It has been a crazy dash. But our Zilker Renovation + Addition is under construction. We are ecstatic to be working with Pilgrim Builders on this one. Branson and his team have been friends now for more than a decade. (Yes, Branson, that is correct). We are honored to be working with them. Attached is a view from the master porch. There is some concrete detailing going on here that only Boothe Concrete can achieve. Excited to be working with Chris again. We have posted a lot of picture of the pool in progress at Ledgecroft. As we work through the remaining finishes our clients requested some renderings of the project to help them envision the space. Ideally this is what we are headed towards. We cannot wait for framing. But first, Dalgelish Construction will be orchestrating the architectural concrete walls. We can’t wait for that either! We have been privileged to work on some inspiring projects at Baldridge Architects. Ledgecroft, however, is a juggernaut. 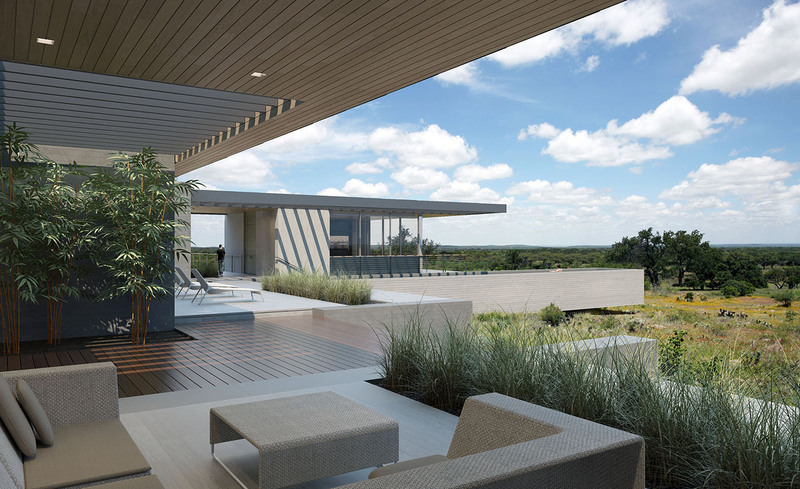 Nestled into its Hill Country setting, this project essentially insinuates itself into the expansive landscape … with one prominent exception. 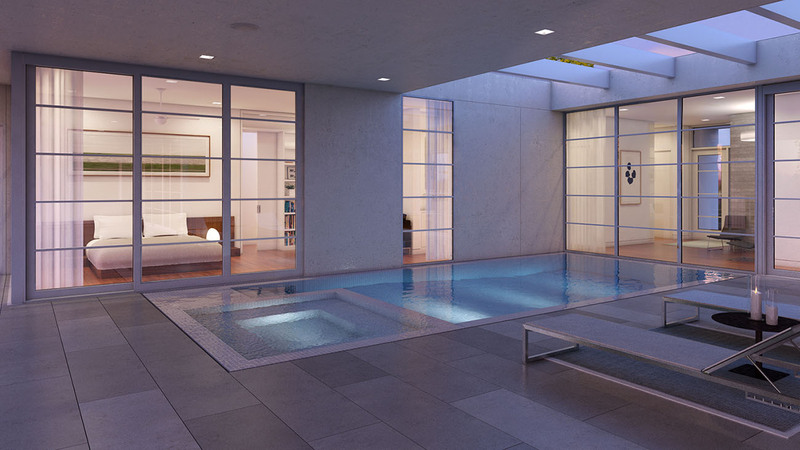 The lap pool. Austin Concrete Development and Dalgleish Construction have really raised the bar on this one. 80′ of v-grooved board-formed concrete (ultimately floating above the grade). Brian Bedrosian walked in it today and opined that it is going to be like “swimming in the sky”. Burton has posted a bunch of photos on Instagram over the last two weeks and his family is tired of the photos. Still, it’s definitely cool. 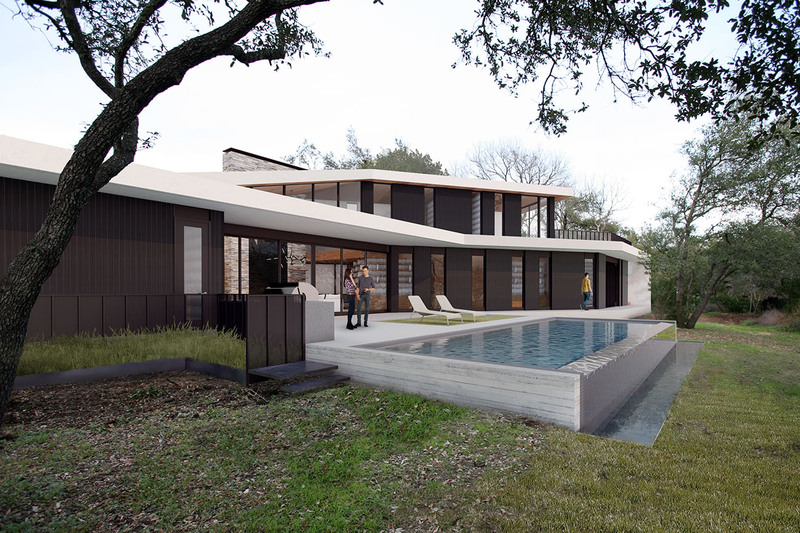 Another rendering from our Zilker project. Working with the trees on this project has been pretty inspiring. Our clients for this project are talented designers and the collaboration here has been really fun. Everything they bring to the table makes this project better. As well, it has been an efficient design process. We will be working with Pilgrim Building Company during construction and we can’t wait to work with Branson and crew again. We have enough representation on this project to open a project page. We will work to do that in the next couple of days! Our project in Barton Hills is finally moving along (after the persistent rains). Jack and Burton met with Tyson and Mike from Acero Construction on Thursday to check out the progress and were able to stand on the second floor to see the impressive view. We love this house. 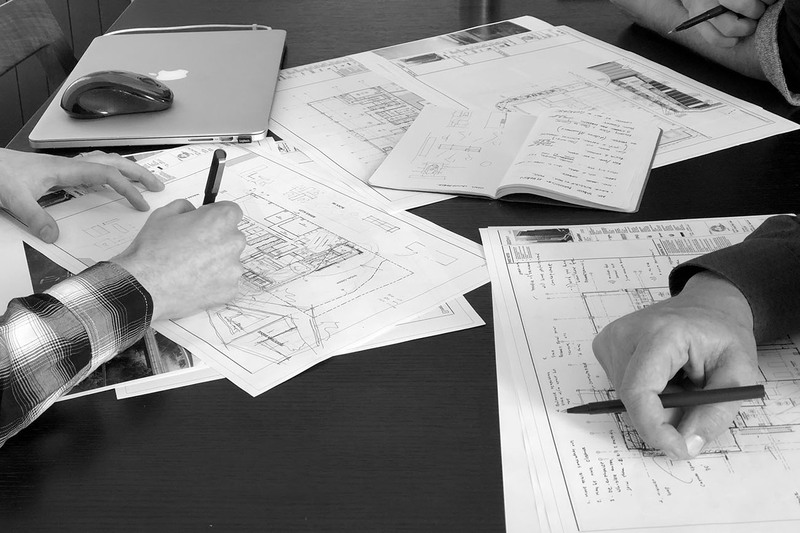 The plan and section cleverly negotiate the site’s constraints and assets while serving our clients’ program better than almost any project we have produced before. We especially like the stealthy nature of the entry. At the cul-de-sac, it presents itself as a modest little project tucked in beneath the trees. It’s only when you enter that you can see what is truly going on here. 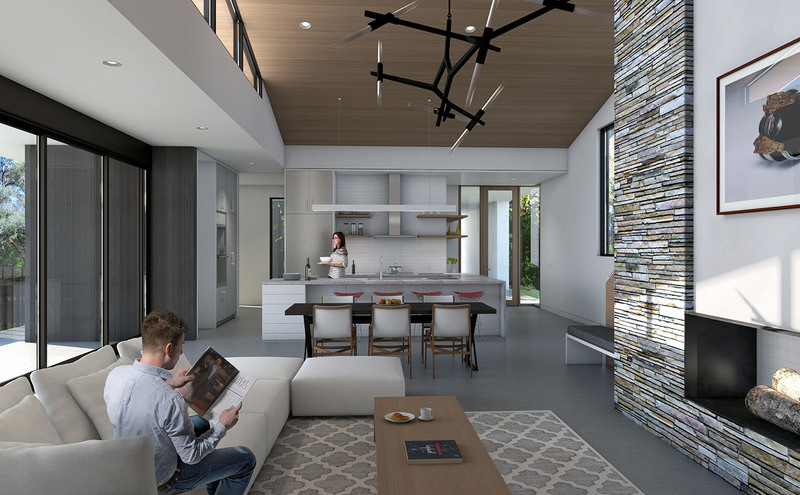 Burton created the rendering above to assist our clients in understanding something of the feel of the interior and the little “reading nook” tucked in below the second story den. We are absolutely ecstatic that the High Road house has started construction and that we are working with Risinger Homes on this one. We have always wanted to work with Matt and Eric we can think of no better place to start than this one. Hammering out some of the final details, our client asked us to investigate some alternate windows. Tyler (again) did this rendering today. It certainly passes the “I want to be there” test. 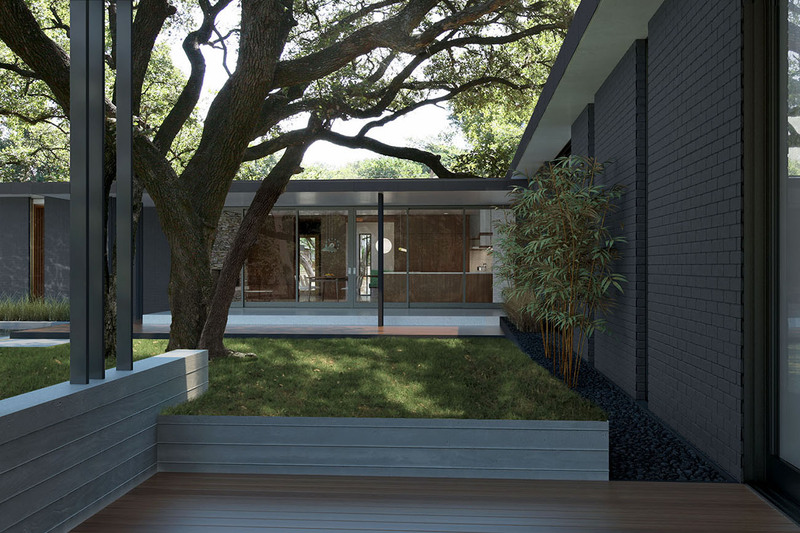 We are excited about this one — our third project in Zilker. That neighborhood seems to be populated primarily by lovely people and our newest clients are no exception. Their previous home was a striking midcentury modern structure in California. While this house was built in the 50’s (with vaguely modern flourishes) we were very excited when we were asked to design in a way that simultaneously looks to the past and to the future. Baldridge Architects offices are located in a minimalist white cube located in Clarksville. In the past, it has taken a leap of faith for some of our clients to accept that for us, the program, site and client wishes drive the style. We’re often asked if maybe we are just too modern. So maybe we’re not the right fit for a bucolic farmhouse, but we can do warm and elemental (see e.g. 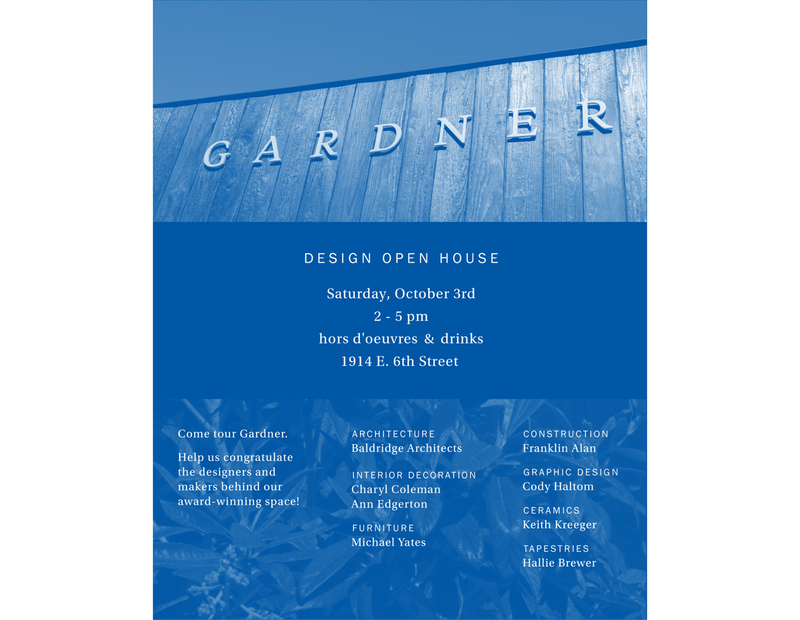 Gardner Restaurant), we can do desert modern (see, e.g. Ledgecroft), and we can do works without obvious precedents (see, e.g. Pinwheel House). 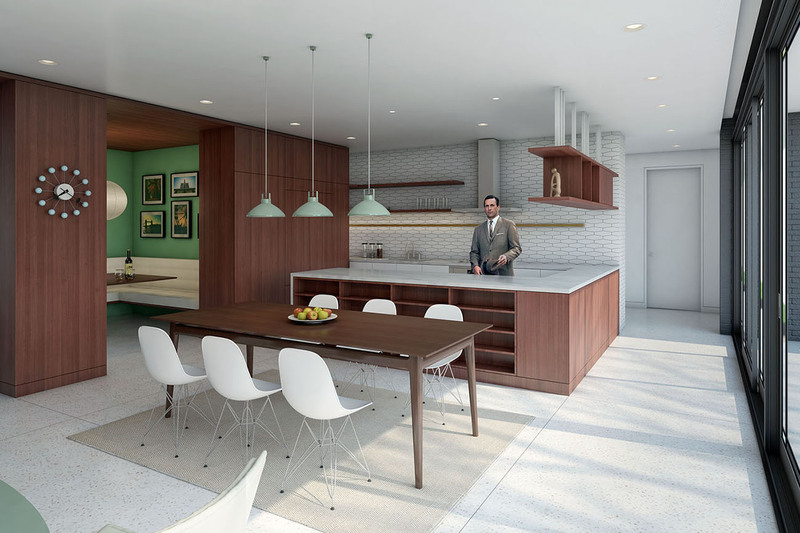 In this case, the order of the day was more of a “midcentury vibe” (to quote our client). Here is our first image. Some serious tweaking in order to be sure, but as a successful initial mission statement, we now have a tailwind. Presently, the project is in design development. More to come in the next weeks! Burton has finally learned enough of V-Ray to do some damage. Weening him from Maxwell was painful. 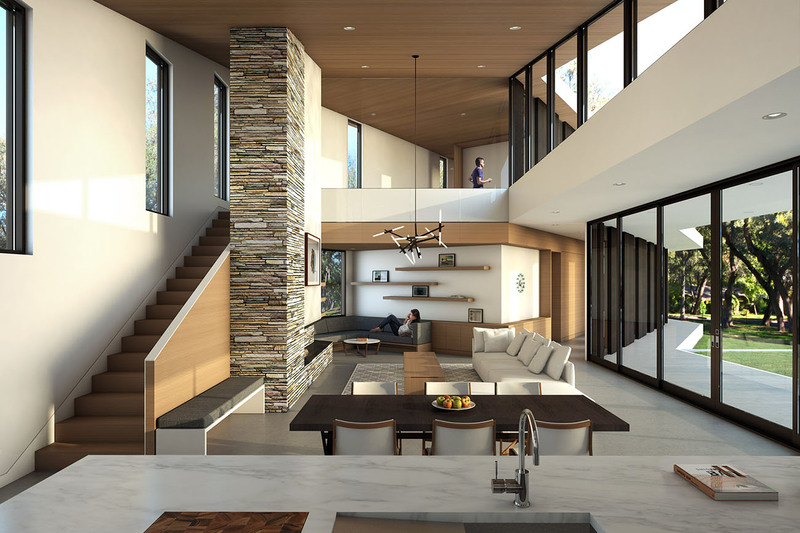 This is a rendering from the interior of the “Branch” house interior. It’s a house in Barton Hills for a family of four. 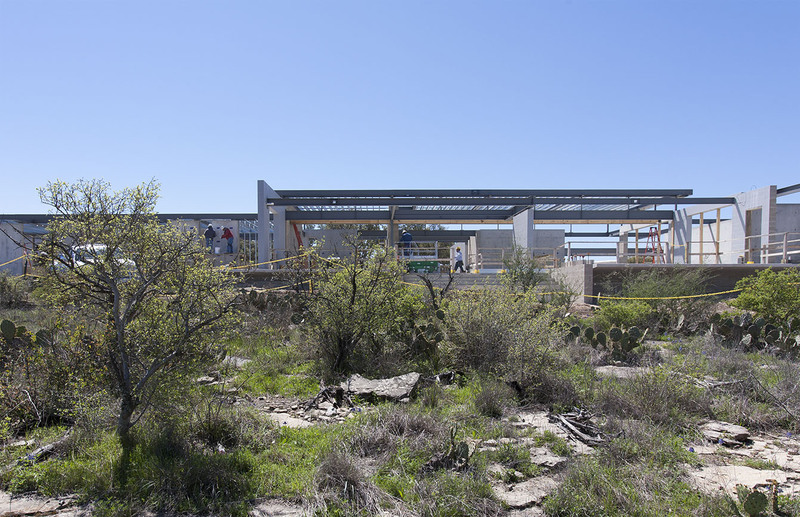 Acero Construction is building and it is currently in framing. We’re proud of this one. Michael and Burton (ok… mostly Michael) have been working on the central stair and conversation pit at the Pinwheel house. This is going to be a singular space. We are grabbing other views from the model and will post them soon. The view looking up is unexpected. 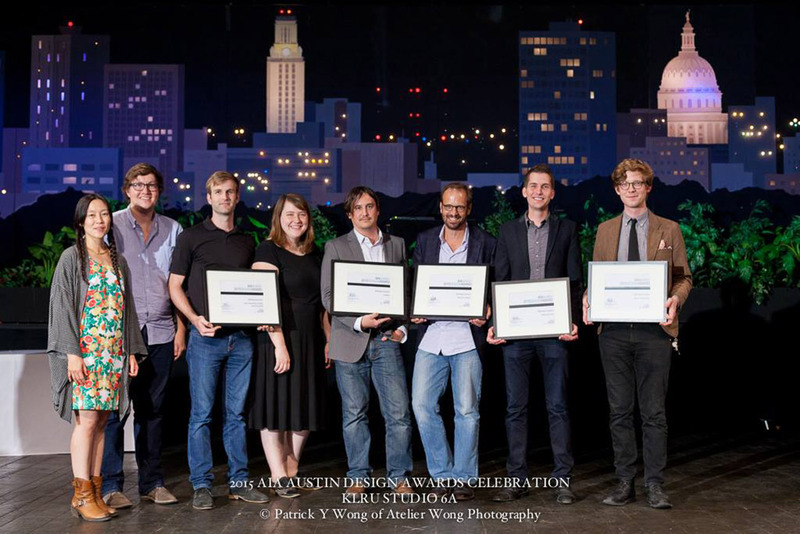 We were very surprised last night at the AIA Austin Design Awards ceremony where we received five design awards for our work. We are humbled that our work resonated with the jurors and are truly grateful to our friends at AIA Austin as well as the rockstar MC, Helen Thompson. On a larger level we want to express our gratitude to our clients, patrons and to this community for fostering meaningful architecture, design and art. Architecture can be a demanding discipline and I (Burton writing here) do not always paint a very flattering portrait of the boots-on-the-ground reality of our profession. Last night was a pretty powerful reminder that this work matters. Thank you AIA Austin. Thank you Patrick Wong for documenting the event. We are hosting a “happening” during the West Austin Studio tour this Saturday (May 9) from 4 until 8 at our studio. We’ll be showing creative works by some of our designers. As important, though — it provided the impetus for a long-delayed open house in our Clarksville space. It will be featured in the May/June issue of Texas Architect, but we would love to see you here this weekend in person! 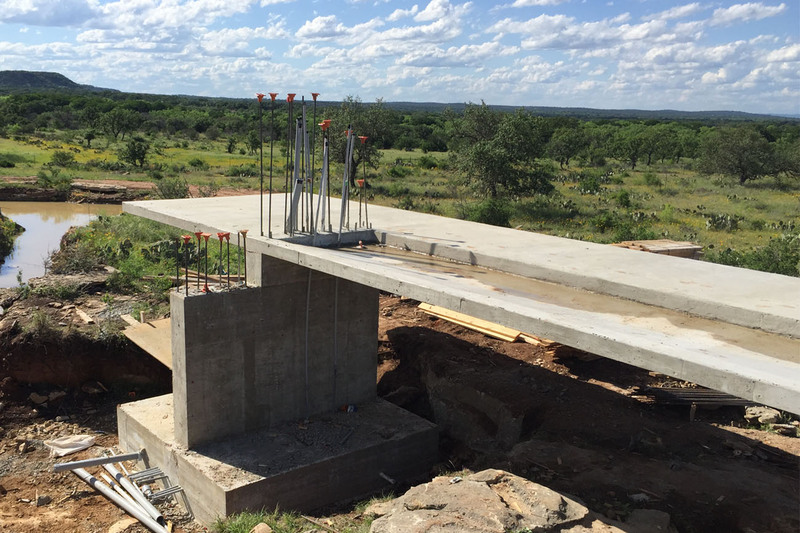 Austin Concrete Development continues its work on the pretty amazing concrete scope at our Fredericksburg project. Burton stole some of his photos of the observation platform. For now, you are looking at the line to the septic tanks on the left. But once the landscape is remediated this will be a place held away from the house where one our clients – both amateur astronomers – will view the stars. The concrete structure bridges 25 feet and cantilevers past a stone clad wall an additional 16 feet. We cannot wait! 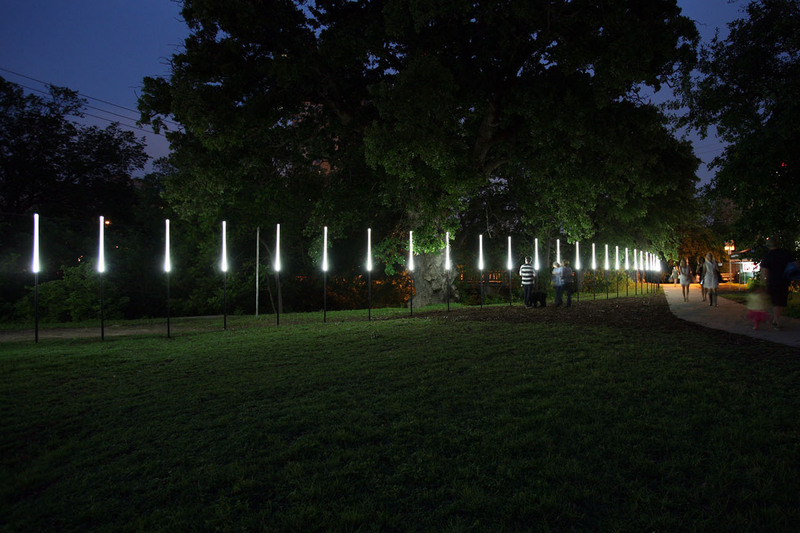 A big thank you to the Waller Creek Conservancy and the Palm Park Picnic people who let us install a modified version of Tracing the Line on Saturday night. It was a great evening ending with an insane storm. Michael took some pretty inspired photos of the evening; it was cool that the installation was flexible enough to be repurposed. We can’t wait until next year! 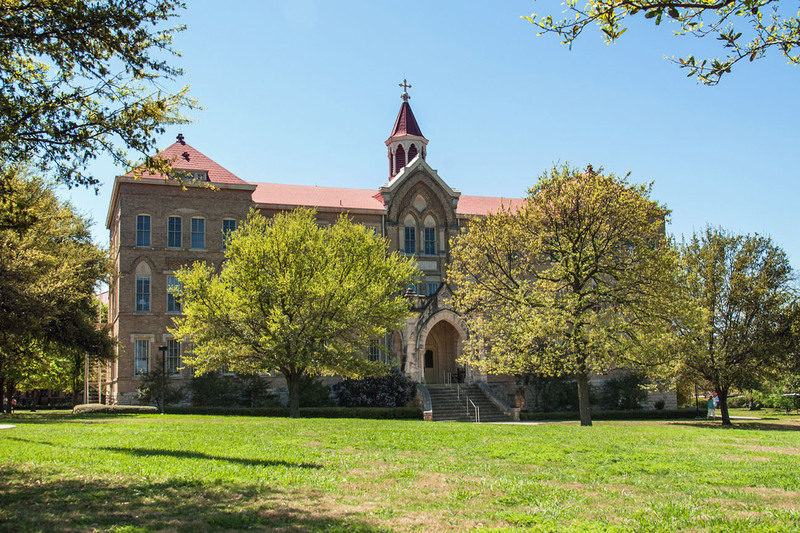 We are beyond ecstatic to announce that Baldridge Architects has been selected by St. Edward’s University as its architect to renovate Holy Cross Hall. Big thanks to the St. Edward’s selection committee, Benz Resource Group, and our historic preservation partner Tere O’Connell. The project calls for the complete renovation of this hilltop historic structure (built in 1903) along with restoration work at the main building. 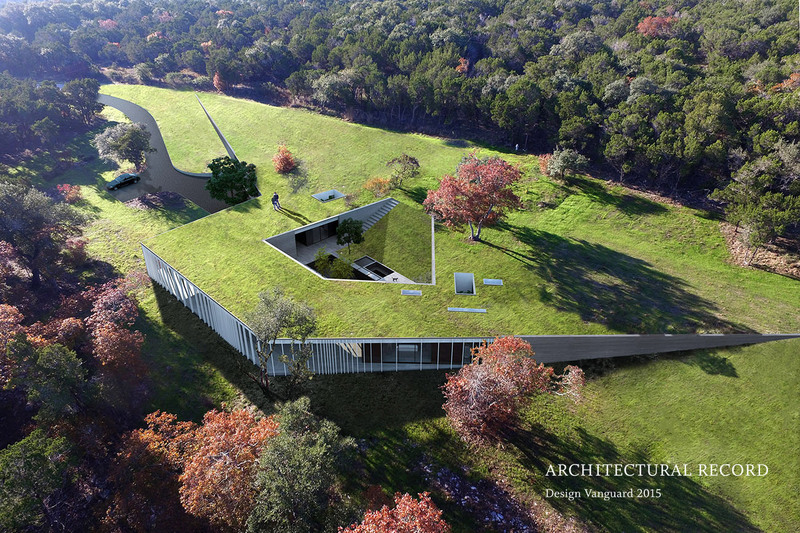 We cannot wait to begin work with the team which will comprise Baldridge Architects, Architexas, Leap! Structures and Big Red Dog (serving as our MEP). Thank you to everyone who pulled together to make this happen! We had beautiful weather in Cherry Springs yesterday. 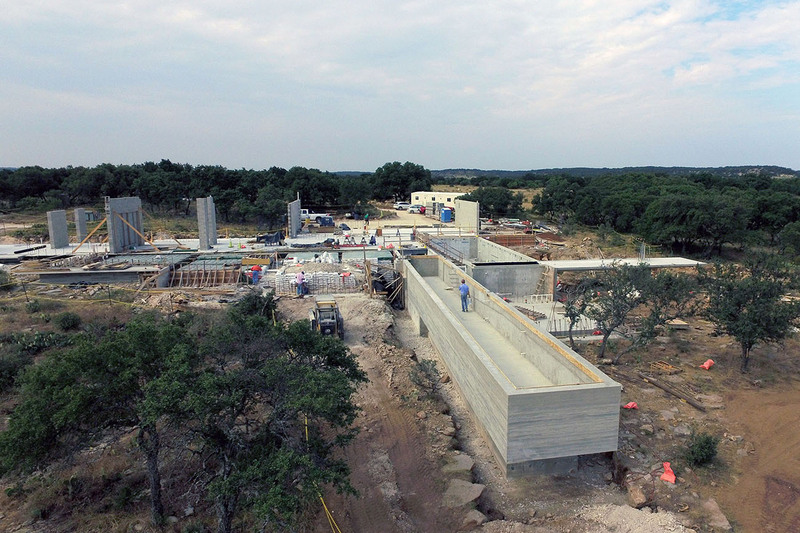 Austin Concrete Development is moving along with this incredible concrete scope. We’re especially excited for this upcoming pour. It is a suspended 30′ bridge to a sculptural cantilevered observation deck. One of our clients is an astronomer; this is where he will set up his telescope. Structures, TX worked with us to design the piece with an integral support beam; in the end it will be a clean pure form. The pour is scheduled for next week, but it will be thirty days beyond that before Rich Ponce and crew will remove the forms. What a tease! Allen Valliant was at the site last week to mark out walls for the upcoming framing and steel scope. The structure ought to begin to take shape soon as well. We will post more soon. An amazing week at Ledgecroft. Everyone knows Dalgleish Construction is good. But this week the project took giant strides. 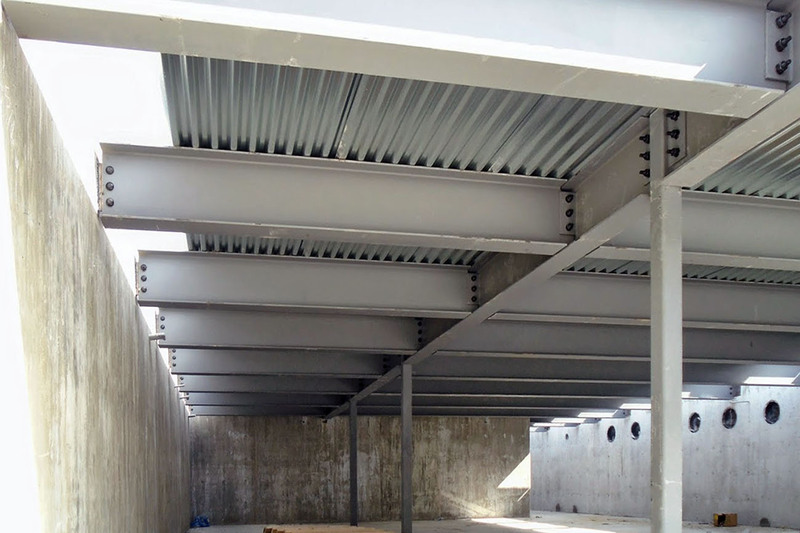 We expected some steel – but the progress was insane! Big thanks to Ryan Bates for the photo! 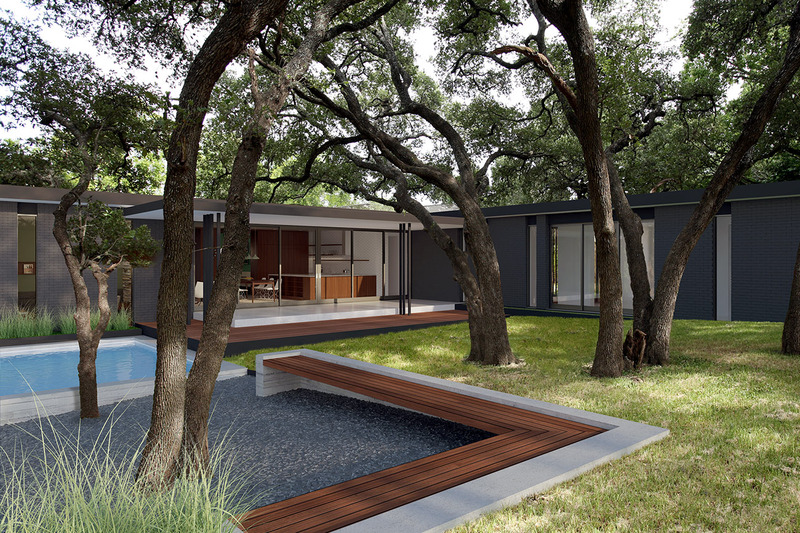 One thing you don’t see on our website is a house overlooking the greenbelt in Barton Hills. The Branch House is set to begin construction in days. 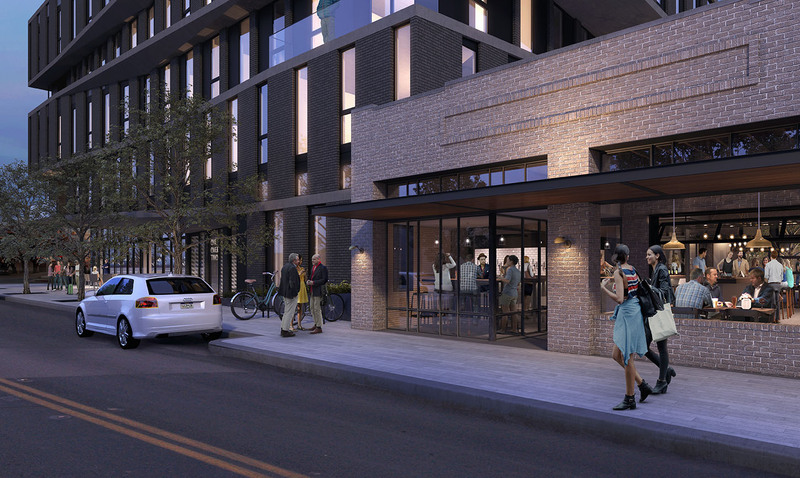 This has been one of our favorite projects and one of our favorite client teams – but there has never been a rendering of the project. Until today (thank you Tyler Frost). We’ll create a project page on the web in the next couple of days. Congrats to our clients and to Acero Construction. We are looking forward to working with Tyson and Mike. We just received Casey Dunn‘s photos of Gardner Restaurant. As usual they are awesome. We will reconfigure the Gardner page soon. We think this may have been the first time we worked with Casey where everything went according to plan. Usually there is a streetlight that turns on, or freakishly tall sunflowers. Once it was a very sudden and unscheduled rainstorm. At Casis Elementary, the majority of the firm and the Baldridge family held up branches to hide a mysterious driverless car that materialized in the middle of the shot. We can’t wait to show you the rest of these. Best of luck to Gardner. AND if you haven’t gone there already, you should!